Three bold lines of applique trim make a bold accent on this light pique shower curtain. The fabric is an easy-care blend of 60% cotton, 40% polyester. Shower curtains measure 72" by 72". We can custom make your length for an additional charge.We can add length for a 25% upcharge that will add after the order is placed. Please leave the additional length in the comment section. Newport is available in White or Ivory Diamond Pique with any color from the Matouk Tape Chart. Newport has three lines of tape in a U-shape. We have this Monogrammed Shower curtain on display in our store and have used the applique font v1000 and have used the black tape. We also used the three lines of black tape for the Newport border. You may choose any tape and we will match the treads. 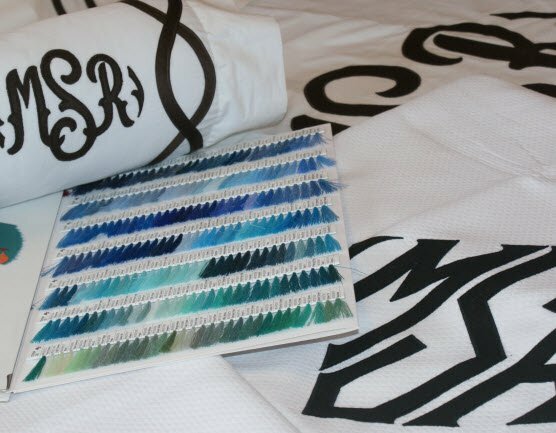 If you would like to choose another color for the monogram please us our tape/thread chart and indicate in the comment section to use another color for the font choice. 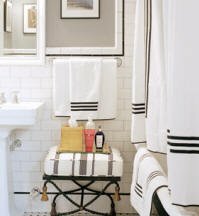 Most will match the thread or applique to the bold stripes that form a U shape on the shower curtain. We have used a diamond monogram for our font. What a great combination with the Newport striped bath towels. Pleased allow 6 weeks for your custom show curtain to be made. This shower curtain can be purchased without a monogram. You are given that choice in the first option. Please see our line of towels and bedding to match the Newport Design. Price: $285.00 In stock! 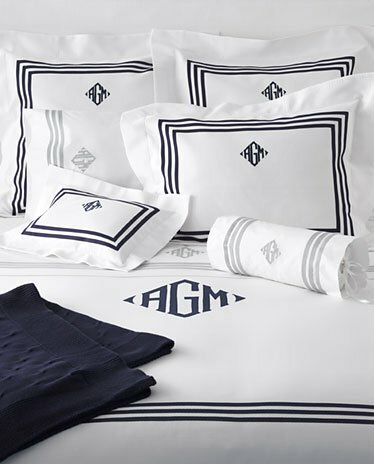 - Browse this brand: Monogrammed LinenOur products are custom made to your specifications. This product ships up to 8 weeks after your order is placed. Choose either the ivory or the white for your shower curtain. You must choose this option for either Monogrammed or Unmonogrammed Shower curtain. Please choose your font choice and tape color. We will match the applique or the embroidery. Please select the font choice for your item. You can choose either an embroidery satin stitched monogram or an appliqued monogram. 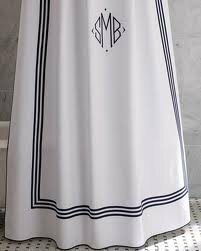 The embroidered monogram will be embroidered with the thread color and the appliqued monogram is done with the fabric tape and a satin embroidery outline. The applique has a price upgrade but it is beautiful when finished. I am in the process of adding more appliqued pictures of the finished product as they are completed. Appliques are truly an art and are my favorite choice.